The other week I was at the Texas Juggling Society meeting, had my son along, which was great, and I happened to be wearing a long-sleeved shirt...which I usually avoid when juggling. I don't like having anything down near my hands that might catch on a club handle or whatever. 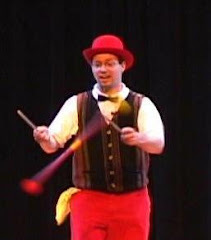 But having the shirt enabled me to come up with a new little trick when spinning plates: it's possible to put a stick in the sleeve of one hand, with a plate spinning on it, and then spin up another plate and hold it in your hand. Might be possible to get two plates going in each hand this way. I can do five catches now. Just, you know, not every day. I set a goal of 10 catches by the end of April. I think I can get there. Once I get to 10, I think 20 will come pretty quickly. I juggled for my daughter's Mother's Day Out program on Monday, and it got me thinking about juggling for the smaller kids. Most of my main repertoire is heavily verbal and uses a lot of audience participation and interaction. And I've learned that that's not what goes over well with the smaller kids, the two- to four-year-old set. Change my expectations...small kids take longer to get jokes and they don't see why some of the tricks are difficult.